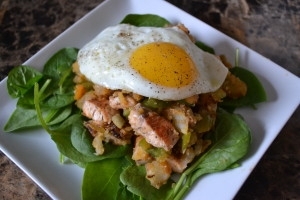 This salmon hash recipe makes a super fast breakfast, lunch or dinner. Plus, itâ€™s a great way to use leftovers! Chop the potatoes and place them into a pot. Cover with cold water, add salt and bring them to a boil. Once theyâ€™re fork tender (about 10-15 minutes), drain the potatoes and set them aside. Heat a cast iron skillet or heavy bottom pan on medium heat. Season the salmon cubes with salt, pepper, and olive oil. Toss to coat. Lay the salmon cubes in the pan, and sear on all sides (4-5 minutes). I like using chopsticks to flip these, it prevents them from breaking up from too much handling. Once the salmon is cooked, remove it from the pan and set aside. Add 2 tablespoons of olive oil in the skillet, then toss in the potatoes, veggies, paprika, cumin and garlic powder. Taste for salt, then season to your liking. Stir to combine, then flatten everything with a spatula into a flat layer. Cook the hash for 10 minutes, flipping sections of it occasionally so it gets those yummy crispy edges. When the veggies are tender, the hash is done! Add in the cooked salmon, and toss gently. You just want to warm the salmon up. Sprinkle with your herb(s) of choice, and serve on a bed of greens, with a sunny side up or poached egg and some hot sauce!